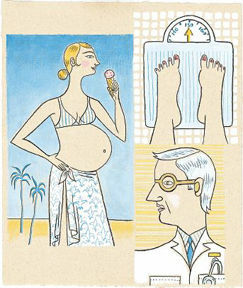 The scale isn'’t the only measure of a healthy pregnancy. From the outset, I had no trouble accepting two immutable laws of nature: 1) Pregnant women get big. 2) Over time, they get bigger. In fact, I greatly enjoyed this process, as evidenced by my avid waddling. I waddled before I was even showing — maybe as early as conception. I waddled excessively in my second trimester. I went whole hog in my third. At first, I was one of those “you-can’t-even-tell-you’re-pregnant-from-the-back” people. (As if pregnancy ought to be a period of clever camouflage: “You’re six months? You look three at the most!”) The books said I could gain up to but not more than 35 pounds. I gained 40. “Forty?! No way!” people yelped. “Well, it must be all baby!” During my pregnancy, I felt healthier, more fit, more alive than in my whole un-pregnant life. I ate well and exercised daily, shook my booty biweekly to “I Like It Like That” in prenatal fitness classes, consumed spinach salads the size of compost heaps. I never once glanced at the scale with shame or concern or regret. I never lost a moment’s shut-eye over my occasional sampling (half-pint) of Ben & Jerry’s frozen yogurt during my last trimester. (Or the Rice Krispies treats I enjoyed on three consecutive afternoons in my 34th week.) To me, those 40 pounds were a glorious testament to my consummate gestation, my brilliant unborn child, my exemplary nutrition and lifestyle. My obstetrician didn’t exactly see it that way. At my checkup one day in week 30-something, he closed my chart and frowned. “Everything looks fine,” he began, and I beamed like a gold-star pupil with perfect posture. “Except you’ve gained too much weight.” I felt the hot lava of shame rising to my cheeks. “Cut out the cakes and cookies,” he ordered with a sideways glance, then shuffled out the door without looking at me, without knowing that I’m the type who reads labels on everything, generally avoids refined sugar, cottonseed oil, red dye No. 4, yellow movie theater popcorn. How did he know that I wouldn’t hobble home in a panic and start dieting? I felt a strange betrayal. I’d walked into the exam room glowing like a firefly and, in a moment, mere weeks before my due date, I suddenly felt as if I’d done the whole thing wrong — as if those “extra” pounds had disqualified me from my own pregnancy. I lumbered home like Lassie after a botched rescue. For 20 minutes, I cried like I had colic. When I finally composed myself, I did the only thing I could do: I called the practice and politely asked that he not be allowed within 10 miles of my perineum on the day of delivery. Yes, I fired my doctor — six weeks before my due date. I knew how well I had carried myself and my baby throughout my pregnancy. The problem was, he didn’t. Sometimes, the books and scales don’t tell the whole story. Guess what? My new doctor said nothing about my weight. She didn’t even seem to notice that I was off the charts by a full 5 pounds. She was too focused on my good health and a safe birth to do the math. You know what else? Those treacherous 5 pounds didn’t matter. I labored for five hours, and our healthy, 6-pound, 14-ounce baby boy was born after 23 minutes and seven pushes. Must have been all that spinach.